First it was an increase in E. coli caused by reusable cloth or non-woven bags after plastic bags were banned in San Francisco. Now, we learn that in Seattle the bag ban in that city, instituted in 2012, is being blamed for a big increase in retail theft. According to an article in the Seattle Post-Intelligencer (“Store Owners Say Plastic Bag Ban Causes More Shoplifting” by Casey McNerthney), the reusable cloth or non-woven bags consumers now carry in that city make it much easier to shoplift. The article points out that many shoppers enter stores with these reusable bags that may contain items purchased in another store. “Even with loss-prevention officers and many security cameras, stores are finding it difficult to distinguish between items that a customer has paid for and items that the customer may have brought with them,” writes McNerthney. Let’s face it, that’s a lot of lettuce! 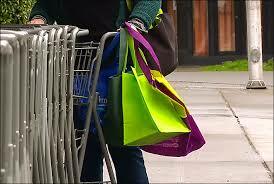 That same store also reported an increase in the number of hand-held plastic grocery baskets that were stolen. That could be good for the molders who mold plastic grocery baskets, but it also means that the store might have to raise prices of their food items to cover the cost of the missing baskets. Which raises the question: What is the REAL cost of plastic bag bans? There are very few so-called “solutions” to any perceived problem that do not cause more, often unforeseen, problems. The entire free-market system is built on the fact that people create ideas to solve one problem and three more problems crop up, which then requires someone to come up with more solutions, which create more problems and WA-LAH!—we’ve created an economy built around solutions and problems!